The team behind the hugely popular Exploding Kittens card game which was successfully launched via Kickstarter, raising more than $8 million in the process. This week launched a new card game again via Kickstarter which has already raised over $1.2 million thanks to over 34,000 backers. Check out the video below to learn more about the latest monster building card game from the creators of Exploding Kittens. It was created by the same people who made Exploding Kittens: Elan Lee (Xbox, ARGs) and Matthew Inman (The Oatmeal). The game takes a few minutes to learn, it’s kid-friendly, and each round takes about 20 minutes to play. After the dust from Exploding Kittens eventually settled, I asked Elan to help with the design of my monster-building game. I didn’t want this to be one of those games where you’re trying to “out-comedy” one another; I wanted it to be more of a deck-building game, such as Dominion or Hearthstone, but without all the complexity. I wanted a monster-building game you could easily play at a party. 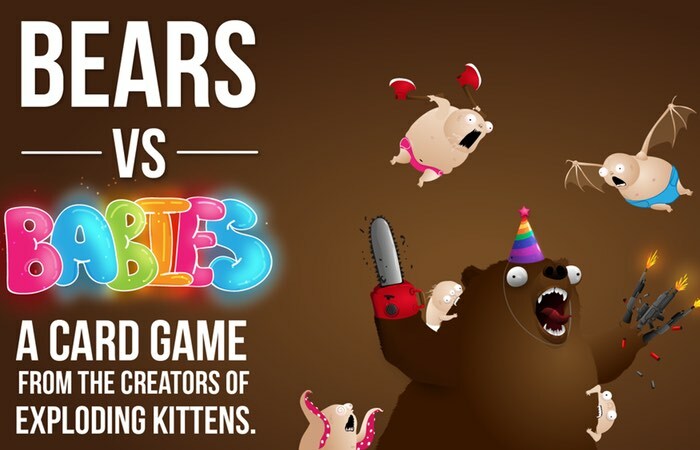 For more information on the new Bears vs Babies card game jump over to the Kickstarter website for details and to make a pledge from $25 by following the link below.